Amongst today’s DDR4 memory releases, it’s difficult to last two minutes without hearing the words “RGB” or “Gaming”, but today we look at something a little bit different. HyperX have launched their Predator DDR4 memory, and while it is available with RGB strips on the top edge, they’ve also realised that many people aren’t such a big fan of RGB lighting and colourful PCs, giving those seeking a more subtle PC the option to go, dare we say it, RGB-less. Available in capacities ranging from 8GB all the way up to 128GB and with speeds up to 4133MHz, the HyperX Predator means business. There’s also Intel-XMP support and optimisations to ensure the best compatibility; furthermore, each stick is 100% factory tested at its advertised speed and is backed up by a lifetime warranty for total piece of mind. 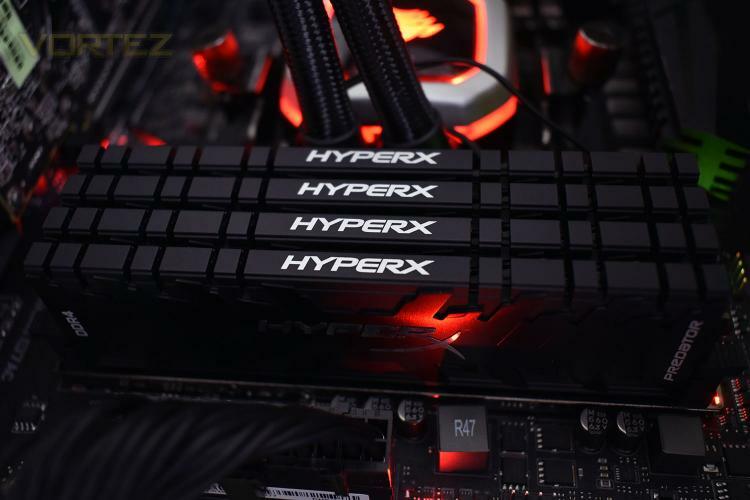 The HyperX Predator DDR4 DIMMs use a large, thick metal heatsink to help keep temperatures in check when running the memory at its 3200MHz speeds, roughly 1034MHz over the JEDEC standard. We also have 4 individual sticks, all packed together tightly, so ensuring the heat can be dissipated quickly is important. Let’s throw this into our test rig and see how it performs.